Back in the dark ages (1995) Intel introduced P6 architecture for the very high-end market in the form of the Pentium pro processor. P6 has stayed its ground and has only just been superseded with the introduction of the Pentium 4 (unless you count the Athlon as post P6 - I'm not getting into that one) but unfortunately the old Pentium Pro and its users have been left in a hole, created by the following factors. 1) The existing socket 7 systems had their level 2 memory cache on the motherboard. Since the new P6 designs had on package (not on-die at this point) they required a different connection, and socket 8 was born. 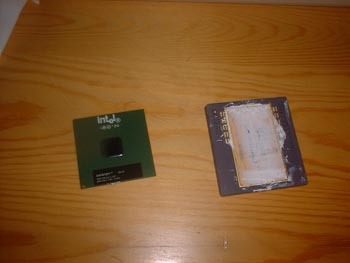 The only further development of socket 8 was the "Pentium 2 overdrive" a P2 333 with full speed onboard cache for socket 8. Converting socket mounted chips to slots can been done with ease. There have been socket 8 to slot 1 and socket 370 to slot 1 converters but, as you can imagine, mounting a slotted chip onto a socket wasn't practical. So that leaves one feasible option - Socket to Socket, and that's just what Powerleap have done. Powerleap are a specialist company for upgrading old systems; for instance they produce a PPGA to FCPPGA converter (more later). 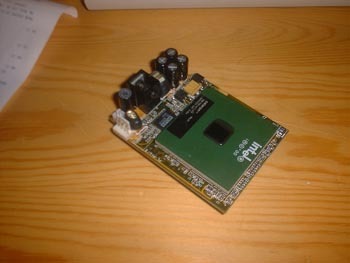 Due to the 66MHz FSB of the celeron it is possible to use one on a socket 8 motherboard (a P3 could be used but a Pentium pro motherboard could not provide the 100MHz-133MHz bus speeds), Powerleap have built a converter that provides the correct voltages and pinout for a s370 CPU. Powerleap have a list of all compatible motherboards (http://www.powerleap.com/PL-ProII/compatibility.htm) and say the following about other motherboards "The only real compatibility issue so far is the problem with systems and motherboards that have a BIOS by Award. Phoenix, AMI, and OEM BIOS's (such as IBM, Compaq, Gateway, Dell) are fine." It's a tightly packed board that just needs a power supply (supplied as a split out from a drive connector power cable). Due to the much larger size of socket 8 than socket 370, the whole thing has a footprint just larger then a pro chip, meaning the possibility of conflicts with motherboard components is kept to a minimum. Fitting it isn't much harder than fitting a new CPU, getting the heatsink clip on is a bit of trouble once the unit's in the ZIF but it's only a case of a few minutes. The one thing that did concern me was that the heatsink clip was going to touch one of my VRM's - a bit of insulation tape sorted that one out. The old and new chips (pro still covered in the thermal paste) time for a pointless, fact free, RANT. Just look at the 2 chips, a celeron 700 ready to go in and an old pro 200 on its way out. No doubt witch has the speed.... but it's plastic, plastic for god's sake. If you dropped one of those pro chips on someone's foot it'd be a hospital job; leave a celeron in the wind and you might loose it. GER! What is the world coming to? …. Rant Over. The new CPU fitted into the motherboard. You can make out the mighty alpha pep66 heatsink next door keeping the 2nd Pentium pro CPU cool. I went from a dual pro 200 system to a single Celeron 700 system. However it is possible to upgrade an SMP system to 2 celeron 533's. The new FC-PPGA celerons (aka celeron 2) are SMP disabled. Well at first it's quite simple to start with, it's a celeron. It has the RAW performance of a celeron. I'm not going to go into the performance details of the celeron since they'll be covered elsewhere. What I will discuss is how running it on a Pentium pro motherboard alters the celerons performance. However it's not quite the same as owning a new celeron system. First of all you're still going to be running 50-70ns RAM. Combined with the small cache size of the celeron it can become quite a performance drain. However I find this an acceptable loss for having such an easy upgrade. The second real problem is that of enabling the cache. Some Pentium pro motherboards aren't able to start up the level 2 cache on the celeron chip so software has to be used one the OS is loaded. My board (phoenix BIOS) was able to load the level 2 cache but, in the interest of what it would be like to boot without it, I disabled it in the BIOS. I'm afraid to say I can't give you a boot time because, despite my wish to be thorough I couldn't be bothered to wait that long. Suffice to say if I disable the cache whilst IN windows I watch each window draw in about 5 seconds. I suppose if it was an application where a server was being upgraded the long boot time wouldn't be an issue due to the long uptime of servers once initially booted, so long as it didn't crash. A bit of a down side, about US$300 for a 700MHz celeron 2. Despite recent drops in price it still turns out you're paying about £100 more than for the chip on its own. At this point you would have to consider the application for the upgrade and whether the savings made in downtime or replacing expensive parts is worth it. It does what it says, upgrade a Pentium pro system to a Celeron system. The extra cost, as I mentioned before, would have to be justified if you either have a lot of other equipment that would need to be replaced (like 512Mb of EDO or such like) or you needed a quick upgrade of a mission critical system. If you do decide a CPU upgrade is the way forward, this one can't be beaten.